Nick has returned to his old home town of Boston to set up his own shop. There he’s urgently summoned by an old family friend. Hedge fund titan Marshall Marcus desperately needs Nick’s help. His teenaged daughter, Alexa, has just been kidnapped. Her abduction was clearly a sophisticated professional job, done with extraordinary precision. Alexa, whom Nick has known since she was young, is now buried alive, held prisoner in an underground crypt, a camera trained on her, her suffering streaming live over the internet. She’s been left with a limited supply of food and water and, if her father doesn’t meet the demands of her shadowy kidnappers, she’ll die. As Nick begins to probe, he discovers that all is not quite right with Marshall Marcus’s business. He’s being investigated by the FBI, he has a lot of shady investors, his fund is in danger and now he has a lot of powerful enemies who may have the motivation to go after Marcus’s daughter. But to find out who’s holding Alexa Marcus hostage, Nick has to find out why. Once he does, he uncovers an astonishing conspiracy that reaches far beyond anything he could have imagined. If he’s going to find Alexa in time, he will have to flush out and confront some of his deadliest opponents ever. I like this character as much as I like Scott Fenney by Mark Gimenez except Nick's more street smart, more resourceful than Scott. This thriller certainly thrills and the momentum was very consistent and when I reach the last page, I actually went, 'oh! it's ending...I want more' and yes, I guess I can hame more of Nick as this is the second of three books featuring this character that the author has penned so far. However, I won't be surprise if there's more titles featuring this hero. 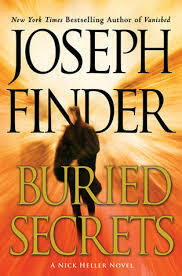 I will certainly be on the lookout for the other two titles in the bookstores and also other titles by Joseph Finder.